Taylor Schell, as Age Category Representative for the 15 – 17 age group, received his trophy from Noel Ratch of Reynolds-Alberta Museum and Henry Effron of the St. Thomas Aquinas Roman Catholic Separate Schools. 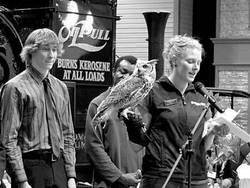 He presented his $100 for charity to the Medicine River Wildlife Centre, represented by a lovely young lady with a special feathered guest, a Great Horned Owl. The Wetaskiwin Leaders of Tomorrow Awards Night showcases the tremendous caring, energy, versatility and creativity these special young people pour into making their community a better place to live. They give of themselves in every way they can think of. In school, they begin by supervising lunch rooms, tutoring and mentoring younger students, then progress through the various levels of planning, organizing and running a wide range of activity and sports clubs and activities. In the community, they are the active doers in the various organizations, setting the example for attitude and involvement. They help at home, help relatives and neighbours, help with fun parts such as decorating, and help with the hard work of set up and clean up. They participate in or spearhead fund raising drives for the good causes about which they feel strongly. For example, six year old Kaylee Belbeck decided to cut her hair for cancer, and in giving 12 inches of it, raised nearly $7,000 for the Cross Cancer Institute. They set the example for volunteering for all of us. This year's 45 nominees are again divided into four age categories: 6 – 11 years, 12 – 14 years, 15 – 17 years, and 18 – 21 years. Every nominee receives a copy of their nomination biography as read at the Awards Ceremony, a certificate of recognition, a Leaders of Tomorrow T-shirt, a professional group photo taken the evening of the Awards Ceremony, and a free, fun-filled overnight Leadership Workshop at the Alberta 4-H Centre at Battle Lake. An Age Category Representative is chosen from each age group to receive in addition a Leaders of Tomorrow engraved glass trophy with their name on it, a cheque for $100 to give to a charity of their choice, a professional 5” x 7” photograph and a certificate of award. The Age Category Representative selected from the 16 nominees age 12 – 14 years is Katie Miller nominated by the Lakedell Agricultural Society. Her active assistance with the many Ag Society events includes making posters, decorating, baking, setting up, selling tickets, working concession and cleaning up. After school, she'll often help the Ag Centre with general office work, stock vending machines or change letters of the Ag Society's highway sign. For the Youth Riding Camp, she created a simple, practical program to reward good sportsmanship, and also made signs for stalls, set up the arena, baked snacks, organized crafts, and assisted younger riders. She strives to set an example and encourage good sportsmanship and work ethics as she plays on the school basketball, volleyball and badminton teams. She helped create the video that was key to her 4-H Club winning a free Gord Bamford concert last fall, then helped set up, work the gate, and sell tickets at the concert. She considers all this and the other things she does as just the right thing to do, and recognizes that working together accomplishes more, so tries to lead with the confidence to take the right risks and work hard so that she and others may succeed. The Age Category Representative selected from the 12 nominees age 15 – 17 years is Taylor Schnell nominated by Pigeon Lake Regional School where his attitudes and actions make him an outstanding role model. As president of the Students' Union and of the Grad Committee, he goes beyond planning and organizing the usual activities such as dances and fundraisers. He initiated a social networking system to keep students connected and informed, consulted with students and staff as to what types of events they'd like added or changed, researches ideas and obtains quotes. For three years the president of the Falun East 4-H Club, he's helped the club collect toys for Santas Anonymous, participate in food bank drives, and do Highway 13 cleanup. For years he has volunteered with ice making and maintenance at the Usona Curling arena, and has done lawn and grounds maintenance for five years for the Usona Ag Society as well as showing the hall to potential renters. He also assists with Ag Society events such as at Hallowe'en and Farmers' Day. He's a goal tender for Ponoka Minor Hockey and also teaches his skills to younger goalies there. Since his dad had knee surgery in January, Taylor has been feeding all the stock on the family farm every day before and after school. He believes in leading by example, learning from each situation, in helping others realize their full potential, and in giving back to his community. The Age Category Representative selected from the six nominees age 18 – 21 years is Alannah Leavitt nominated by the Millet and District Historical Society. For many years, she has used her special talents of creativity and artwork in museum exhibits, children's programs and parades. In regard to the Chinese culture exhibit, she designed the dragon patterns for the flags on Millet streets, painted the dragons and Chinese lanterns in the museum, decorated the museum Millet Days Parade float, handed out fortune cookies, assisted the Chinese dragon dancers set up their drums and recorded their performances. At Hallowe'en Scavenger Hunts for preschoolers, she takes photos of each child for the costume contest and leads the children in fun activities. She has helped set up, participated in and clean up the Millet Haunted House since age five. She volunteers for face painting, wrapping Secret Santa gifts, and food bank drives. She painted the Eiffel Tower and other world landmarks on the old gym walls for the Griffiths-Scott Grade 9 Graduation. For three years she has been on the cheerleading team for Wetaskiwin Composite High School Sabres and helped them win Bronze at Provincials this year. She's also a member of the WCHS Grad Committee. She defines leadership as always showing respect and helping others before helping self, and hopes that her example will result in a positive chain effect. Other comments about leadership from the nominees include a desire to inspire others, to be a good role model, to be an example of a good sport, to make the world around a better place, to lead by example, to make everyone feel included, to build confidence in others, to help make a good day for others, to build character, to give back, to be a role model displaying the qualities expect from others, to help keep kids happy and out of trouble, to communicate clearly and respectfully to all, to show what is right, to go to great lengths to help, to enrich daily lives. One person can make a difference by making one person's life easier and happier. Giving back helps the volunteer to grow as a person. A special skill is to be able to get people helping before they know they're actually working. One willingly gives up personal time for something one believes in, making it better for others. Giving back broadens awareness. If you want change, why don't you make it happen? Even the smallest contributions can make a big difference. What I do is worthwhile if I can make at least a little difference in one person's life. Too often volunteers are unsung heroes. These were recognized. Tomorrow is in good hands with leaders such as these!